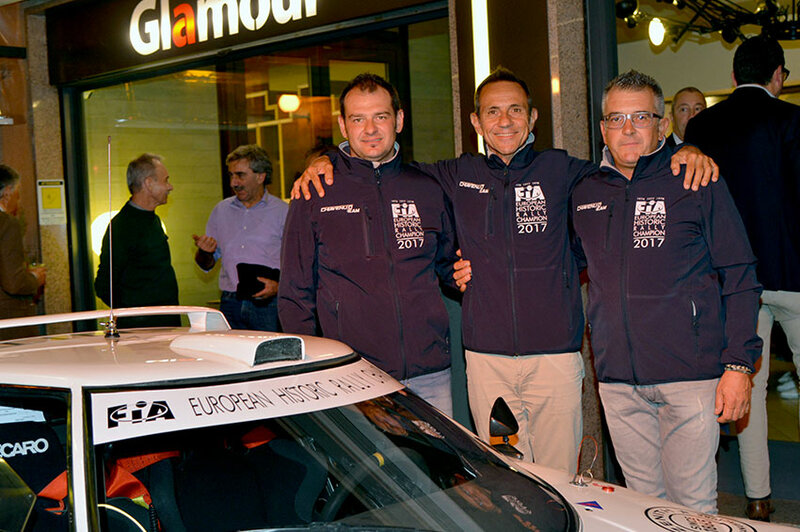 The Chiavenuto Team has celebrated the European Historic Rally Championship title with a special evening in Biella, his home town . 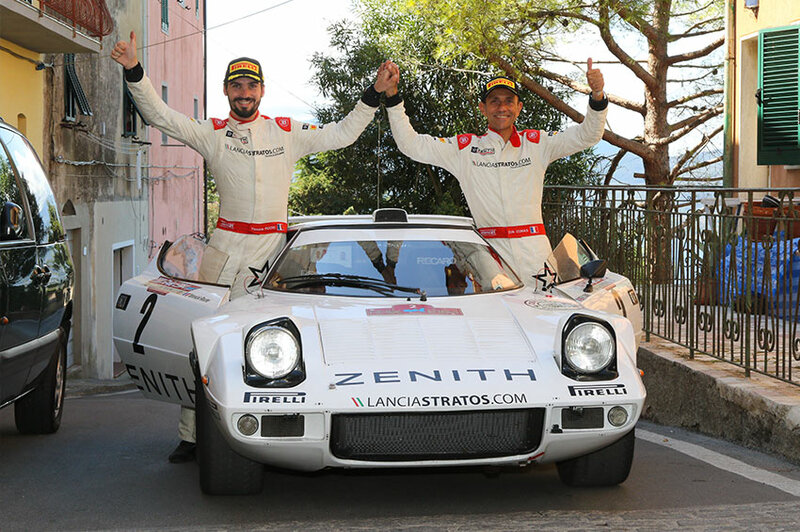 Forty years after Darniche/Mahé in 76 and 77 with MFS Maglioli then Carello/Perisinot in 78, this is again a French crew with a Biella's preparator that offered to the rally queen its fourth European rally title. Many thought Comas’ challenge to target overall victories with a Stratos would not succeed but all his friends present at the party were convinced of the contrary. 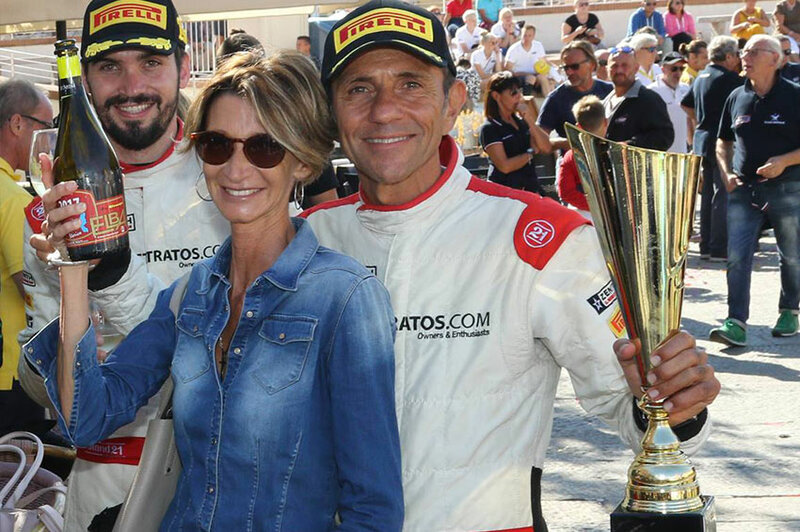 Erik Comas happy said: “this is a real victory made in Biella, four years ago I even didn’t know about Biella, MFS Maglioli apart, and today I owe it all to Biella, I met Raffaella exactly here and we’ll marry on next year. As far as we are concerned tonight, I dedicate this victory to Andrea Chiavenuto. After several try in Italy, Switzerland then France, this is a few kilometres from the ex Maglioli workshop that my Stratos is now being prepared with high satisfaction. When have you thought that you could win the title? Exactly on April 13th when, after a disastrous first leg in Costa Brava on five cylinders, my second place is only due to an awful weather and to my tyre choice, I took possession of my car in Marseille from the team that was caring it from three month. I brought it to Andrea and from that day my life has changed. I finally found an humble person, not willing to impress me, motivated and rare in this world, honest. In five days during Easter weekend, working days and nights, he has fixed all that was left over during the winter and we immediately won our first rally together in Czech Republic. This was the first of our three wins with Alpi Orientali and Elba. Nobody before him during the last six years that I am running on the Stratos has managed to reach this level of preparation with a total discretion and a transparency never seen. I succeeded where other failed, reliability, performance and budget respected. Our complicity was built immediately from this success, an unforgettable victory under the rain again. What can you say about Yannick Roche your co-driver? Another unprobeable encounter fallen from the sky, the perfect co-driver, without him it would have been difficult, besides being an excellent navigator he took care of all the administrative aspect before the rallies: the recces plans, the service plan, the tire pressure and the fuel consumption. Never in two years I had a look at my watch to check the timing, a total trust that has allowed me to drive at my best, relaxed and precise, which was necessary to compete against more modern cars up to 1989 such as the Delta, Sierra, M3, Legacy, 037, Porsche RSR and group B. 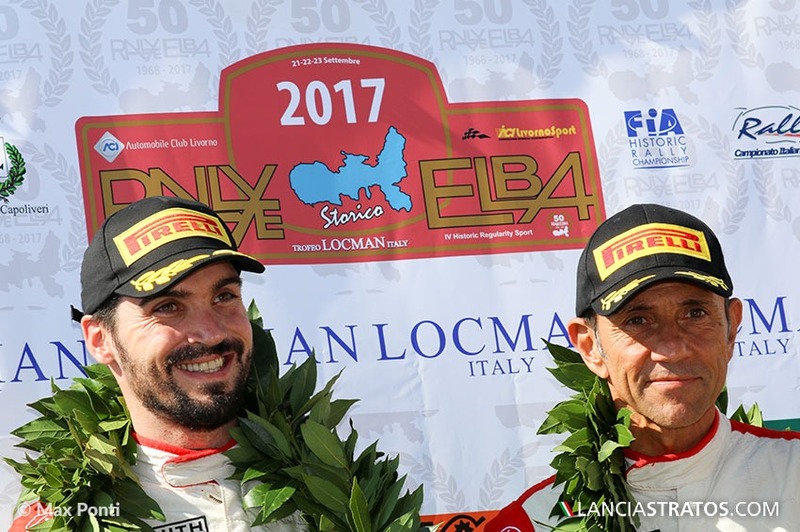 We have built a strong relationship with our two victories in 2016, Targa Florio and Asturias, but this year we were even stronger. His behaving is perfect in any situation and he has the profile to be one of the best WRC co-driver. Was the Stratos the best car for this championship? The Stratos is my loved car and I cannot be impartial to answer it. In period without any doubt it was the best car even until 1981 when Darniche last won a WRC rally in Corsica. Then arrived the group B as the Porsche SCRS and the 037, later the group A as the M3, Sierra and Delta 4X4 whom obviously outclassed the Stratos with new technologies such as turbocharger and four wheel drive. However you won ahead to rallymen such as Batistolli that are rallying in these competitions since forty years? I know my Stratos by heart and I know its strong points, lightweight and agility. With its V6 Ferrari 2.4l and carburetors we have only 250 CV and missing power and torque versus the Porsche and mainly the Delta with 100hp more on four wheel drive. For our category2 (1971-1976) we cannot use dampers with adjustment unlike the category 4 (81-89) increasing even the difference. I therefore had to prepare any rally with a theoretical setup based on my previous experience, except on Ypres that I was discovering this year. During the races I have quite often changed the antiroll bars setting, the ride height and the gear ratio, a positive point to the Stratos if built correctly. By consequence we always became stronger after few stages and we won all the rallies that we have been leading whatever the category of adversaries. We won all the downhill fast special stages where the car is acting very well on the Pirelli P7 Corsa classic. Was your track experience helpful to reach this success? Track drivers are very exigent on the car preparation on many details, all details make the difference. Andrea has been intelligent to never interfere on my way to setup the car and I never interfered on his way to prepare the car, the engine and the gear box. We, I mean Andrea, Yannick and myself had equal weight in this team success. 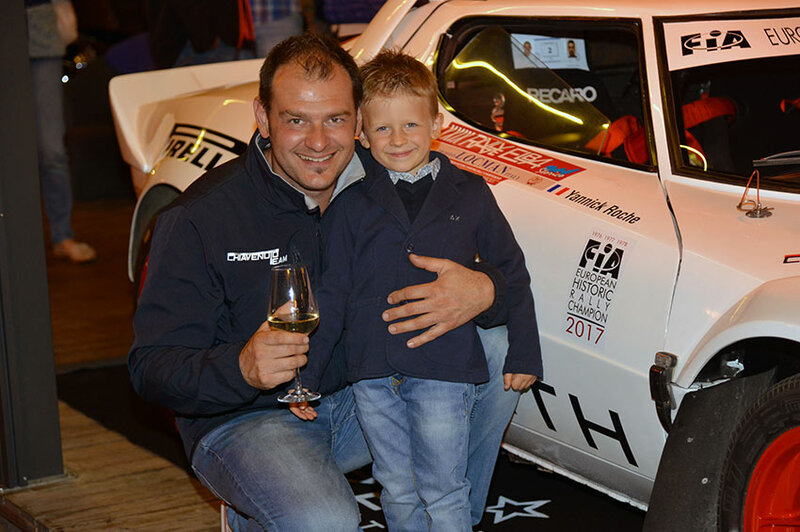 More than my track experience this is my rear wheel drive experience that has been helpful, this is my world and I have been able to push the Stratos to its extreme limit improving it stage after stage with small technical adjustments such as you would do on a single seater car. Andrea we imagine that this European Title is a huge satisfaction for you as the car preparator ? All this happened very quickly as this program was not in my scheduled before mid-April. Erik has trusted me without even knowing each other. I have put a point of honour not to disappoint him to the price of long working days and unrelaxed nights. So yes the satisfaction is immense, a job well done and it is a privilege for Chiavenuto Team to wake up the forty years old story. To work with two pro such as Erik and Yannick has bring me a lot of racing knowledge and I don’t think that this performance can be renewed in the future as the gap with more modern cars is increasing. Without a fully dedicated approach to any single rally and an attention to details never seen before, we would have not won. This has been a wonderful human adventure with two great men and I think the Zenith Stratos has become one of the most desirable.